This tab contains details of the HTTP request errors. Warning: For more information about various topics affecting this subject, such as Filter by Zone, Population or Virtual User, see General information about test results. The number of errors displayed varies depending on the zone, Population and Virtual User selected during filtering. If the "Storage capacity exceeded" warning message displays, it indicates that the actual number of errors recorded during the test exceeds the number of errors displayed. By default, the maximum number of error details stored is 20,000. Information: Increasing the maximum number of stored errors will have an impact on NeoLoad performance. In the [Results]category, change the value of the max.errors.store.count key. The default value is 20000. Time is the time between test start and occurrence of error. Code is the error code: the HTTP error code as defined by the HTTP protocol, listed in HTTP status codes or the Neotys error codes, listed in Neotys status codes. Duration is the duration of the failed request. Size is the size of the server response content in bytes. Page is the link to the definition of the page containing the request with the error. 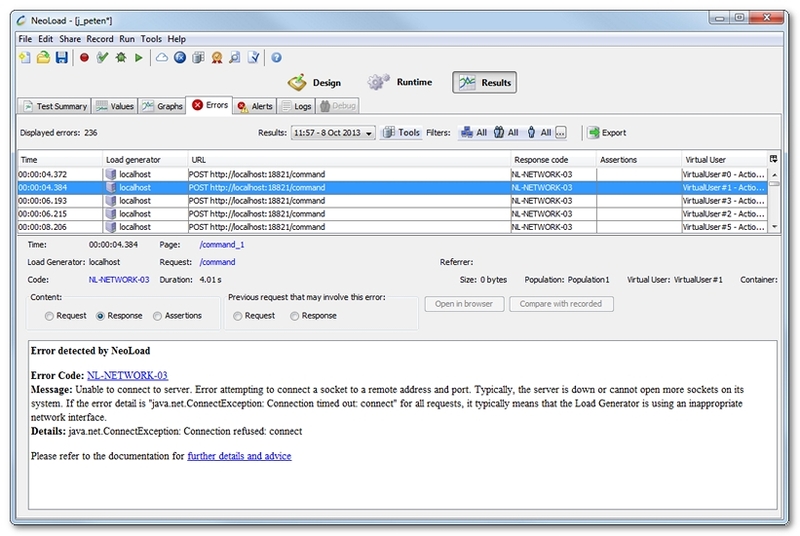 Load Generator is the name of the Load Generator that played the request containing the error. Population is the Population within which the request containing the error originated. Virtual User is the Virtual User within which the request containing the error originated. Request is the link to the definition of the request containing the error. It displays details of the HTTP request sent to the server. It is necessary to check the form parameter values if need be. It displays the server response. When the server could not be contacted, it contains an error message generated by NeoLoad. Information: The details of the response are only stored and displayed for the first few errors in each request. If the details are not available ("Response not stored" message), it is necessary to go back to the first requests flagged in error to obtain more details. When an SAP Action is selected, displays the screenshot of the SAP Action in error. It displays the assertion results (validations) for the response. It is empty if the assertion is validated. It displays details of the previous request to help find the root cause of the current error, since an anomaly or error on a page may cause the following page to fail.